Succulent shrimp are marinated in KRAFT Dressing, then nestled in a creamy tomato and basil sauce and served over hot cooked fettuccine. 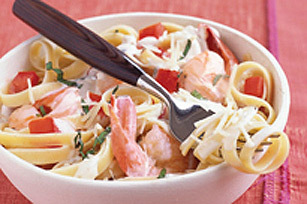 Pour dressing over shrimp in small bowl; refrigerate 20 min. to marinate. Remove shrimp from marinade; discard marinade. Heat large skillet on medium heat; add shrimp. Cook 3 min. or until shrimp turn pink, stirring frequently. Remove from skillet, using slotted spoon; cover to keep warm. Set aside. Add tomatoes and half of the basil to same skillet; cook and stir 3 min. Stir in cream cheese until well blended. Add shrimp; cook until heated through, stirring occasionally. Place hot fettuccine on large serving platter. Top with the shrimp sauce. Sprinkle with remaining basil and the shredded cheese. Substitute 1 can (19 fl oz/540 mL) diced tomatoes with garlic and olive oil, undrained in this recipe.